Agathi & Co. Headquarters @ 34 Elton St.
All good things must come to an end, but we learn and grow as the years pass us by. 2015 was a huge year of growth for Agathi & Co. and we know 2016 will be even better! 2015 was a history making year for Agathi & Co., the events were some of the best yet. Beginning the year off with a brand new office located in the Neighborhood of the Arts! The space has been a creative think tank for Agathi and her genius event ideas. 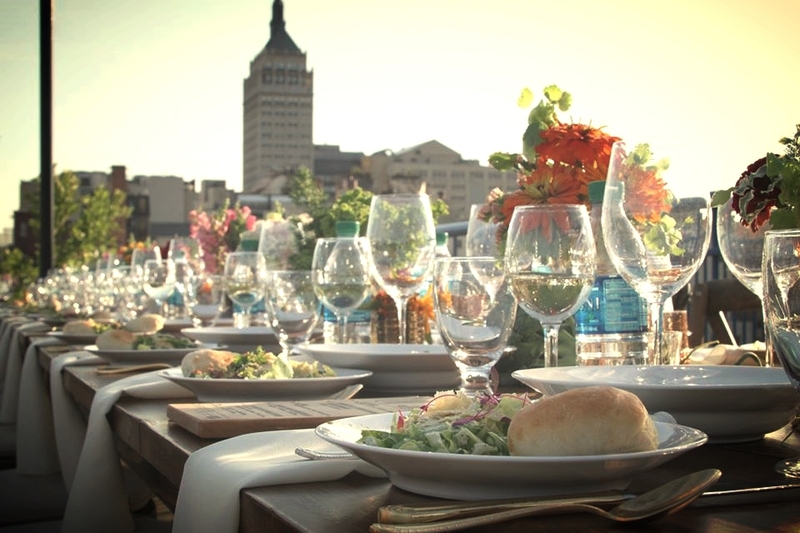 The Greentopia Dinner on the Bridge was one of the most successful events of the year. In July, Agathi & Co. implemented an event that had never been done before. The logistics of serving a six-course meal on a bridge without a kitchen was an ordeal, but the vision was there and perfectly executed the night of. It is an event that is still being talked about months later! La Femme Women's Exhibition, a vendor style event created to celebrate women, continued to succeed in the Buffalo and Syracuse areas, and expanded into Rochester with a big splash. In Rochester, La Femme was featured on the front page of the Living section in the Democrat and Chronicle which really helped put the Agathi & Co. brand on the Rochester map! Special thanks to Mark Liu and Mary Chao for making that possible and to the Holiday Inn Downtown for hosting the expo! With 2015 in the books as a history making year, we move into 2016 with the same incredible momentum! Starting with Agathi being invited to 98 PXY as a guest host for a WHOLE WEEK, which allowed her to share more of personal side to herself and her business. “It was a cool experience to really open up to people in a unique way,” says Agathi. Agathi & Co. will continue to work with Greentopia on their second annual Dinner on the Bridge to be held in July, 2016 as well a brand new event to debut this May! Greentopia will be hosting a Garden Party, which will debut their Flour Garden on Browns Race and it certainly will not disappoint. It is still in the planning stages, but we are very excited to be a part of something so unique! Between planning La Femme in Buffalo and Rochester, organizing Greentopia and Fringe Festival events, as well as various events throughout the year (open houses, seminars, WEDDINGS!, and so much more), Agathi and her crew of #fancygirls are as busy as ever. This year will also provide opportunities to approach business by exposing Agathi & Co. as a great company to work with and to work for. The website will feature a new blog including ideas on event planning, fashion, and supporting local businesses. The social media for Agathi & Co. will be getting a facelift so be sure to follow the changes as they are being made. In 2016, Agathi & Co. welcomed Lauren Sformo (me) as an Event Assistant to help with the day to day operations of events and social media. I have a vast background in social media, search engine optimization, client relations, and most importantly event planning. I started event planning in college and have continued to be involved in the event planning world ever since. I am very excited to be working with Agathi and to help plan some amazing events.